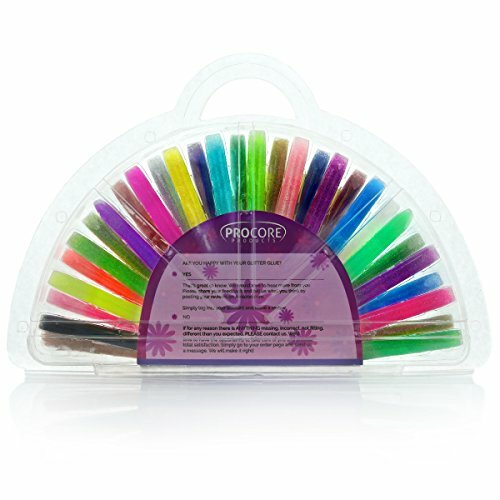 More Fun, Fabulous Colors: Most glitter-glue sets have only 10 to 12 pens... maybe 16 max. But your ProCore Pack provides 30 3-D glue sticks in a wide range of sparkly colors for endless enjoyment. Perfect Size for Kids 3 & Up: Many tots have a hard time grasping fat jars & skinny pens. Luckily, your ProCore glue sticks are just the right width for tiny hands. Even 3-year-olds squeeze with ease. Fine Tips for Detailed Artwork: Forget those bulky glitter-glue bottles. With these fine-point pens, kids & adults alike can create intricate 3D paintings. Ideal for writing & drawing as well. Safe & Nontoxic: Made with soft, flexible plastic, your ProCore iridescent glue pens have no sharp edges or toxic ingredients. Pens & glues are 100% washable for fast & easy cleanup. Exclusive Plastic Case: Most glue pens come in flimsy boxes, easy to damage & misplace. But your ProCore 30-Pack arrives safely packaged in our hard, rugged clamshell case with handy carrying handle.